In last week’s post, we explored the idea of setting New Year’s resolutions (or goals) for one’s business. Specifically, we focused on setting one or two specific, meaningful, and doable goals intended to help your microbusiness become (more) socially responsible. This week, we are going to explore what it means for your business to “go green” and what that might look like for microentrepreneurs and solopreneurs. When you think of an environmentally sustainable business, what do you imagine? Do you imagine a company that manufactures earth-friendly products and is housed in a state-of-the-art, LEED certified building, replete with low flush toilets, nontoxic carpeting made from recycled materials, solar panels, LED lighting, a living roof, and not a plastic cup or bottle to be seen anywhere on the premises? If the next image that went through your head was multiple dollar signs accompanied by the thought, “Gads, how would my microbusiness ever be able to pay for a green makeover on this scale?” you can relax. While the mental picture I’ve just painted might be an achievable goal for some companies (yes, even for some microbusinesses), this might not be the ideal goal (never mind whether it’s even feasible) for your particular business structure or model. It especially shouldn’t be your short-term (three months out) or even medium-term (1-2 years out) goal. I can assure you that even when microentrepreneurs have successfully achieved many of the ideal green benchmarks outlined above (a living roof, no plastic cups, plates or bottles to be seen, a small eco-footprint), these savvy business owners got there through small steps taken over many years. Toby Barazzuol, the owner of Eclipse Awards—a Vancouver-based socially responsible business featured as a case study in Small Business, Big Change: A Microentrepreneur’s Guide to Social Responsibility—emphasized that the path to environmental sustainability was an ongoing journey: one that he and his business had been traveling for six years (that was back in 2012). Yes, I know we’re encouraged to dream big, but as I emphasized last week, in order to achieve one’s goals, it’s often better to be a realist, start with something small and manageable, and keep taking small steps forward. Whereas Toby made the decision to transform Eclipse Awards into a socially responsible business several years into running his business, other entrepreneurs I interviewed for the book—for example Linh Truong (The Soap Dispensary) and Lori Del Genis (Conscious Elegance)—had consciously started their businesses with the intention of running environmentally sustainable companies that reflected their personal values and commitment to the three Rs of sustainability (Reduce, Reuse, Recycle). Whether you started out as a sustainable business or you’ve been in business several years and have recently decided to transform your business practices and philosophy, your starting point for the S-R transformation process is an assessment of where you’re at right now. Gather your utility bills, your financial information, a notebook (and pen if you plan on using a paper-based notebook), and find a quiet place to reflect on the following questions. What green practices do you already have in place? In what areas do you know you’re falling short and would like to make some changes? What’s your motivation for greening your business processes? Are you ready to take on these changes? Do you have the resources (both the financial and social capital) to implement the changes you want to see? Do you have the time to take on changes that are a multi-step process? If you have employees, are they on board with your vision? What about your customers? If you implement a change in business processes and some portion of that cost is going to be passed along to your customers, will they still be as supportive of your green transformation? You will also need to assess three footprints that tell you how lightly (or not) we’re stepping on the planet. There are two ways to proceed with the environmental assessment process. You can either invest in a professional audit, or you can opt for a D-I-Y approach. As I explain in Chapter 2 of Small Business, Big Change, a professional audit might be worth considering if you own or lease your business space, you know there are some aspects of your business that are resource or energy intensive (2012, p. 73), and/or a professional audit might be a required component of becoming a certified sustainable business. A professional audit will assess your business practices and processes in terms of your carbon, water, and ecological footprints, and will then provide you with a set of recommendations and strategies to reduce the size of your footprints. For solopreneurs and microentrepreneurs whose enterprises are not especially energy or resource intensive, a D-I-Y approach might make more sense, especially if your office space is in your home. There is also the not-so-small matter of the cost (money, time, or both) of doing an audit. A professional audit is the “champagne budget” version of the assessment process. If your spending capacity is more in the “lemonade budget” range at the moment, consider taking advantage of various D-I-Y tools available in books and online. If you opt for a D-I-Y version of an environmental assessment, you’ll want to head over to the online assessment tools to calculate your carbon footprint, water footprint and ecological footprint. Once you have the results of these online assessments, consider them in the context of your responses to the questions posed above. But first, take a few minutes to congratulate yourself for any green processes that you already have in place. Have you already gone paperless? Great! Do you make an effort to print double-sided or only purchase recycled or ecofriendly paper? Give yourself credit for taking some steps in the right direction. Now, let’s start giving some thought to a reasonable goal or two that you can set and achieve, given your current level of resources and time. Small, simple goals that will yield a success or “win” in a reasonable time frame are more likely to keep you motivated if you’re just starting out on your green transformation. Although it may be tempting to be swayed by slogans such as “go big or go home,” taking on a project that it too complex or too far outside of your comfort zone will not serve you well if it derails and topples your confidence, financial resources or professional reputation along with it. If you are overwhelmed by a long list of “to dos” and don’t know where to start, pick one or two small action items that you can put into place with a minimum of fuss and expense in a short space of time. Remember: sustainability is about conserving existing resources. Start by choosing actions that either reduce consumption of a resource (or the need for frequent replacements) or reuse existing resources. Turn off lights and appliances when you’re not using them. Use a power strip for electronic appliances and switch the power strip off when the electronics are not in use. An important caveat: If your phone service is provided through your internet connection, make sure your modem and router are plugged into a separate outlet, or you’ll accidentally disconnect your phone service. Opt for virtual meetings and reduce the transportation portion of your carbon footprint. Reduce your paper use; be selective about what you print, and if you must print, use the double-sided setting on your printer. (Bonus points for the extra effort it takes to do double-sided printing on an ink-jet printer.) Reuse junk mail and sheets of paper with one-sided printing by repurposing them as scrap paper or note pads. Replace disposable cups, plates, cutlery, water bottles and paper cups with their reusable equivalents. There will be days when you forget the reusable water bottle or travel mug: Don’t beat yourself. Instead, investigate how you could make small tweaks in your routine so that the reusable cup or bottle doesn’t get left behind. If your business model includes shipping products to your customers, consider finding ways to either minimize the packaging and make it easy for customers to reuse or recycle it, or look into switching to eco-friendly packaging and labels. Gradually replace incandescent light bulbs with either Compact Flourescent Light bulbs (CFL), or better still, LED (light-emitting diodes) bulbs. The good news is that the latter are becoming more affordable and because they have such a long life, they save both energy and money in the long run. Look into carbon-neutral options for local deliveries. Switch to alternative energy sources. Develop a sustainable supply chain. What strategies have you already tried? If you have already started your S-R transformation process, what has been the most rewarding activity so far? The most challenging? Are there strategies that I haven’t included that you would like to share? I’d love to hear from you, so please do post a comment. Eclipse Awards makes awards for recognition events. The company has created a line of awards made from recycled and reclaimed materials, among other green accomplishments. 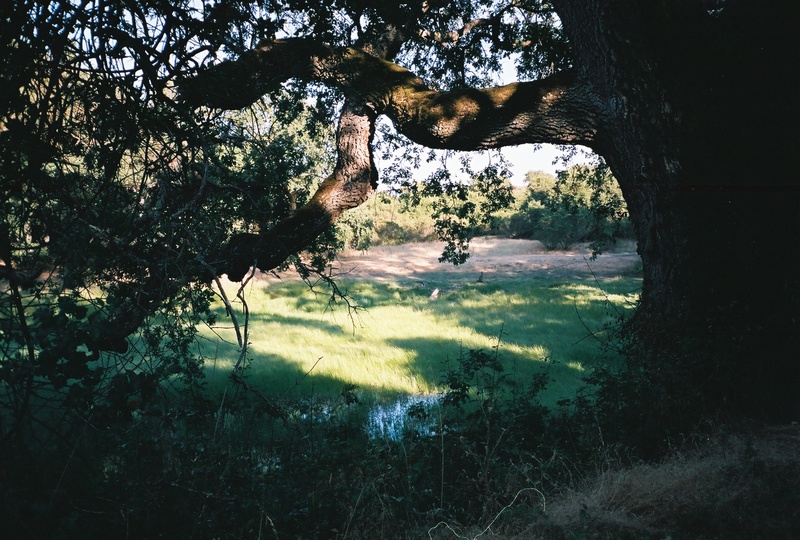 Chambers, Susan (2012). 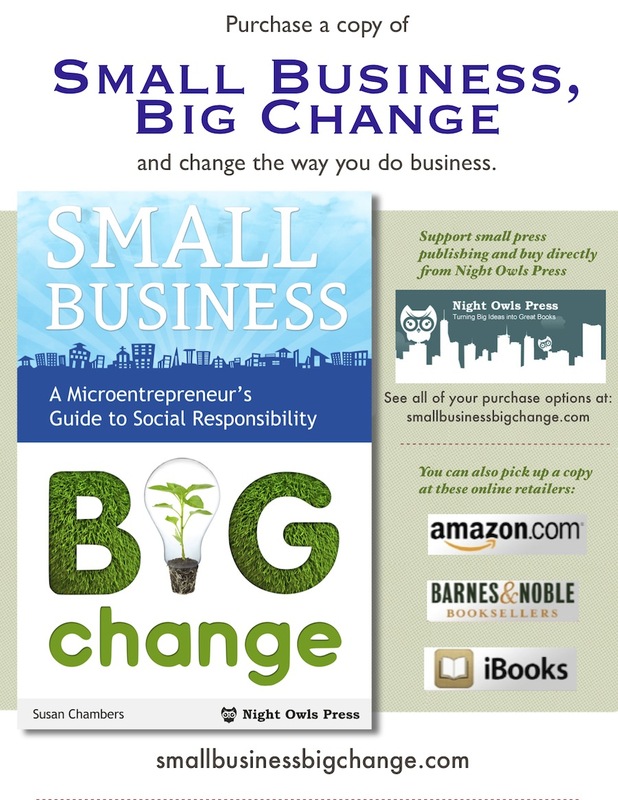 Small Business, Big Change: A Microentrepreneur’s Guide to Social Responsibility. San Francisco, CA: Night Owls Press. Linh’s store offers a wonderful array of eco-friendly cleaning products for the home and the body. One of the key premises of her business is keeping plastics out of the landfill by encouraging customers to reuse their plastic containers. Customers bring in their empty containers and Linh’s staff fill (or refill) the containers with the customers’ products of choice. Lori uses environmentally friendly hemp silk, reclaimed silk from previously-worn wedding dresses, and organic cotton thread to create beautiful, eco-friendly wedding gowns. She has a no-waste policy and finds ways to use almost every scrap of material. You will need to track the results of your actions to see if they have made a difference. For example if adopt a strategy to reduce the amount of electricity use (energy), set up a spreadsheet and track the number of kilowatt hours on your electricity bill to see if there is a downward trend in the kilowatt hours used. To get a sense of how reduced output translates to a positive impact on the environment, consult your local utilities company website to see if there is a page that explains how much carbon is saved by reducing your electricity use by “x” kilowatts over “y” period of time. Cut the sheets of paper in half, then in half again. Staple the pieces of paper (blank side up) together, and Presto! Instant pad of paper.